Hi folks. We now enter a special stage – we start to learn how to prepare the perfect coffee. 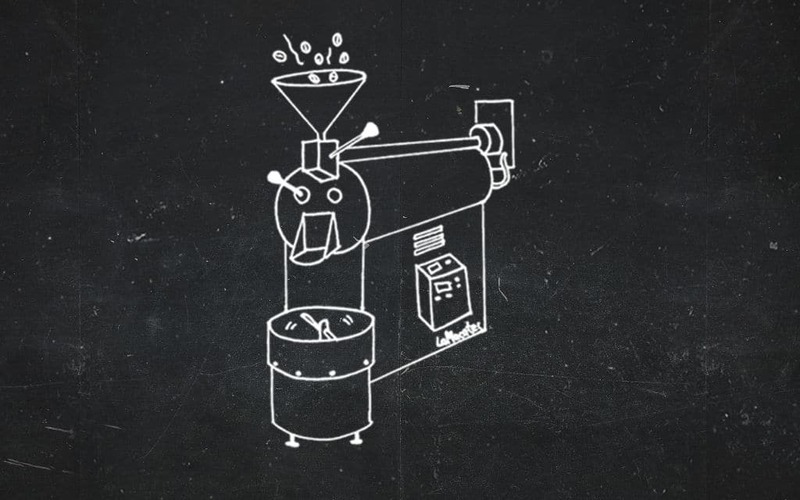 For this purpose we must begin with one of my favourite topics: Coffee roasting. The main difference of the following topics to the preceding ones of our coffee story is that you can practise them on your own assuming you have the required equipment. If not you’ll anyway benefit from the deep understanding and makes you more confident with the whole coffee preparation process. So enjoy the next chapters and look forward to the insights you’ll gain from them. Before entering the roast process we must discuss some theoretical essentials. This means that this topic is divided into theoretical principals and the practising guide. The term roasting refers to the dry and fatless heating of the coffee bean. The roast process is initiated at a bean temperature of 100°C and ends, depending on the roast grade, between 200°C and 260°C. In general: the higher the temperature the shorter the roasting time. The duration of the roast process and the used temperature are significantly responsible for the different coffee sort’s individual taste and flavour. Light roasts in general have a smoother taste, dark roasts provide more bitter compounds and are therefore better suited for espresso. The water, contained in the coffee beans evaporates. Due to the overpressure inside the beans resulting from the evaporation and roasting gas, the beans are bloated to their approximately double volume. The outer coffee skin detaches and falls off, this is called the first crack. The bean changes it’s color which turns from light green into yellow, yellow-brown, light-brown up to dark-brown. For darker roasts the second crack is awaited which means that the beans lost more water and the cell structure begins to burn. Depending on the roast grade oils can leak. The specific coffee flavour occurs due to plenty of chemical reactions, referred to Maillard-Reaction. This reaction is a so called nonenzymatic browning reaction. Here under the influence of heat amino acids and reduced sugar are transformed to new compounds. Until now more than 800 aroma components could be identified. Within the bean’s cells one to two percents carbon dioxid and in smaller quantities carbon monoxid arise which, depending on the roast grade, leakage from the cells. This can take up to two month. The raw coffee’s loss of weight during the roast process, depending on the raw coffee’s water content, is between 11% to 20%. After the roast process the roasted coffee is cooled down rapidly by using a cooling strainer on which the hot coffee beans are poured out off the roasting drum. A strong air flow and a mixer take care that the roast process is interrupted immediately. It is essential that the bean’s core temperature shrinks down to the room temperature as fast as possible. After the roasting and cooling process the beans remain outgasing for hours, sometimes up to two month. For the case of packaging the beans packages with an aroma valve must be used to let gas pour out but avoid to let oxygen in. More common practise is to store the roasted beans for a while and package them after they are outgased completely. There are a lot of more different designations for different roastgrades, typically determined by local preferences. Now I describe a complete roast process. I love roasting and do it with one of my favourite coffee roasters, the Lamacatec No.1. It is no secret that this is a roaster my company sells. 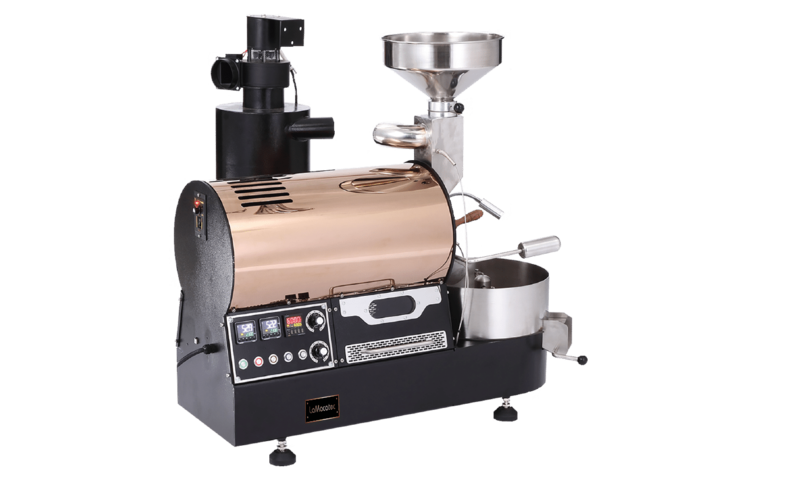 It is a typical shop roaster which means you can roast batches fromm 500 grams to 2 kg. If you want to read more about this coffee roaster than follow this link. The first step is to heat the roast drum. The temperature shall reach 160~200°C. Please keep in mind that all values for temperatures and times are guide values. Depending on the desired roastgrade and used beans these values will vary. As soon as the drum is heated accordingly we can fill in the beans trough the hopper, this metod guarantees that all beans are filled into the drum at once, so that all beans are processed equally. The temperature will fall down rapidly, the drying process starts right now. At this point the energy and drum speed shall be reduced slightly in order to provide an equal and smooth drying process. Approximately after 2-3 minutes the bean’s temperature reaches 130°C and the color starts to change. When the temperature rose to 165°C we must reduce the heating power in order to slow down the rising of the temperature because we are near to the so called first crack. The first crack starts at 185 ~ 195°C. The first crack is that phase when the beans begin to burst, you can hear this, it sounds like preparing popcorn. Depending on the desired roastgrade we must stop the roast process now or continue it to produce a darker or stronger roast result. This is up to the further processing (see above). As soon as the beans reached the wished roastgrade we must empty the roast drum and cool down the coffee beans. This sounds extremely easy, doesn’t it? But there is a big but – one needs a lot of experience to hit the desired roastgrade because the temperature and time control depends on the raw beans you use, even the humidity of the workplace is a key factor. Professional roasters use roast profiles in order to optimise their roast process which does not mean that roasting is a kind of trial and error. It is a system to reach the optimal desired result. To go a step further one can connect the roaster with a computer equipped with special software which reports the whole roast process and makes it reproducible. If you want to try it yourself, please feel free to contact me. I’ll may give you some useful hints to start this unique experience. If you are already familiar with roasting coffee than write down your experience in the comments and exchange with others.